Indie rock in 2016 is more than Pavement- and Nirvana-copycats. MTV’s David Turner was wrong when he wrote “Indie rock died in 2009, or 2004, or maybe it was 2000” earlier this month—how can he discount Animal Collective, Arcade Fire, Bon Iver, Sufjan Stevens, TV on the Radio? These groups brought unique sensibilities to the genre, many creating subgenres themselves (how many Panda Bear copycats have you had to endure at basement shows since 2007?). Turner hedges on his hyperbolic declaration almost immediately, though, honing in on far more legitimate critique: the white male voice in indie rock is boring! Self-serious sensitive dudes are now, for whatever reason, the face of the genre. It’s as if Pavement’s inherent goofiness has been massively misinterpreted for sincerity and sobriety. Turner highlights DIIV’s Is The Is Are and Porches’ Pool, two derivative, navel-gazing records that ask you to wallow in their Brooklyn ennui, “I’m young and I’m sad!” There are more examples, of course: Cymbals Eat Guitars, Kurt Vile, Mikal Cronin, Real Estate, Titus Andronicus, War on Drugs… these guys make pretty music, but they have nothing to say. I saw Kurt Vile at The Ottobar a couple weeks ago and nearly fell asleep. Stereogum’s Chris Deville responded to Turner’s essay, arguing that “emo’s creative renaissance” will save indie rock—or at least revitalize it for the white male voice. He cited bands like The World is a Beautiful Place and I am no Longer Afraid to Die and Sorority Noise as reasons to believe in the genre. Both bands turn emo’s classic introspection outward, using it not as a tool of self-effacement or self-pity, but as a means of connection, an encouragement. Looking at these two bands in isolation, sure, it’s easy to say that emo—which is sounding more and more like indie rock—has been rejuvenated, and will restore the relevancy of white-dude-guitar-music. But what about the other bands associated with the scene? 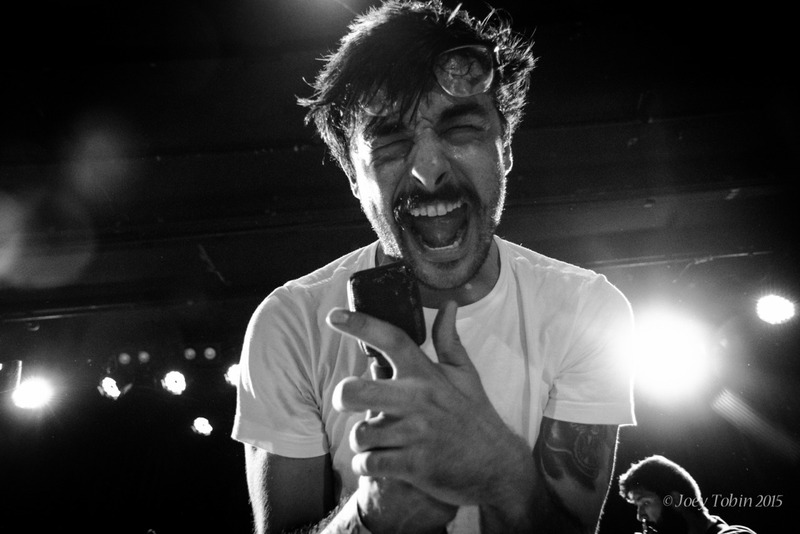 Both of Foxing’s records sound like artisanal versions of Fevers and Mirrors. Whereas Connor Oberst’s 20-year-old angst felt visceral and immediate, Conor Murphy’s is acidic and sour. On the band’s signature song, he wails over and over again, like a fractious child, “Why don’t you love me back?” Um, maybe it’s because of that Williamsburg mustache. I’d hate to look at that guy’s bookshelf. He probably has five copies of Infinite Jest. And on that note, the “emo revival” has also been characterized by pseudo-literary, barf-inducing lyrics. Take this verbose excerpt from Into It. Over It.’s “Spatial Exploration”: “You know, I pictured you determining success behind a diamond ring/But wedlock made you settle, kept you running from the truth/A certain age defines uncertainty I never could explain.” Emo’s predominant topic is still white dude’s with girl problems. The common theme running through both of these critiques is, again, self-seriousness. While indie bands shouldn’t go full-Malkmus and make apathy their defining characteristic, they should learn to laugh at themselves. That’s why someone like Mac DeMarco—the class-clown of the music world, who’s earnest on-record and goofy on-stage—has become a sensation. Parquet Courts, a relevant, contemporary indie rock band, thrive on the dynamic of the rigid Andrew Savage and the relaxed Austin Brown. Brown brings levity to Savage’s workaholic, humorless attitude. Seriousness is often conflated with significance; humor with lightness. This isn’t true, of course. George Saunders—one of the funniest, and most significant, contemporary writers—has said that “‘serious literature’ doesn’t have to be serious.” This applies to music, too. You can make great statements through comedy. Courtney Barnett is perhaps the best example of this. Her lyrics are funny, sure, but they also explore weighty subjects like gentrification, pollution, death. “Depreston,” the best song from her debut album Sometimes I Sit and Think, and Sometimes I Just Sit drifts from coffee machines and lattes to a rumination on aging and mortality. Turner does rightly acknowledge that women are at the forefront of indie rock, and Barnett is leading them. Frankie Cosmos’ new album of image-dense, concise pop songs—Next Thing—is out tomorrow, along with Japanese Breakfast’s ethereal, 29-minute debut, Psychopomp. Bully, Dilly Dally, Hinds, Waxahatchee… they’re more than revivalists, and reasons to believe in the genre going forward. Being a serious/sensitive white dude I can see how there's an over saturation of this kind of music. Still there are a whole lot of white dudes out there seeking and relating to other white guys playing music about their problems.